This is a recently built Castle in Johnson City on Degrasse Dr., off HWY 11E (Bristol Hwy) on the Watauga River. On the Gated entrance it says "Grindstaff". It was a private drive, but, you can see it very well from the street in the winter, looks to have a 5 or 6-story tower. The above named castle was built by Steve Grindstaff, he is a businessman here in town. I know that the grounds boast a go kart track, a swimming pool with slide, and at the back the property borders Watauga Lake, with it's own dock and boat house. I can give you some details on the Grindstaff castle on your site, i've been inside the entrance hall, kitchen and a large living room and office/study. The go-kart track someone mentions is an exact replica of the NASCAR track at Bristol, a mere 15 mins. up the highway. It has the same 38-degree banked turns and everything, just smaller scale. He has 4 very fast replica formula one cars for it, each costing over $50K. The interior has much copied from European castles. He brought over craftsmen and had some here for as long as two years. They had molds of wall carvings, crown moldings, etc., that they duplicated here. The detail inside is nothing short of exquisite. The front door and most of the fireplace mantles were brought over from Europe. I'm thinking one of the mantles was over 6 figures, but my memory may be fuzzy -- this was 3+ yrs. ago. He has been featured in some magazine for his home theatre. Some world-class A/V designer put it together, down to the fabrics used for the best sound absorption. Regarding Grindstaff Castle, in Johnson City, Tennessee, this has nothing to do with the castle but the history of the land it’s on. It is build where my grandparents used to live in a log cabin. There was also a large barn there and they had a houseboat that was docked on Watauga lake behind the Grindstaff home. I have pictures of the log cabin after they vacated it. I heard someone bought it, dismantled it and put it back together somewhere in North Carolina. I played in the cow fields in front of what is now the Grindstaff home and there was a long, winding gravel road that led out to the main highway. I have lots of good memories of that time. There was a mean bull that lived in that cow field and it chased my brother and cousins one day. There is also a very old cemetery somewhere around that area. Behind the Grindstaff house is a brick mansion built probably in the 1800s and owned by the DeVault (spelling?) family who also owned the log cabin my grandparents lived in. I wanted to let you know that the Steve Grindstaff castle in TN is on Boone Lake, not Watauga. As of tonight, 1/10/09, the Grindstaff Castle was in flames. Hasn't posted to the news as of yet. Fire has been burning since before 7 or 8 pm tonight. Just a FYI, it burned today, - lightning. The Steve Grindstaff Castle on Boone Lake in Tennessee burned last night. It was more than likely caused by a lighting strike. Just though I would let you know. Since the last update on the Grindstaff castle in Johnson City, TN indicated it burned, I thought I'd give a current update. It was repaired and it was listed for sale prior to the lightning strike that caused the fire. 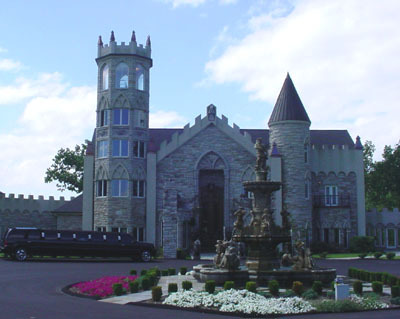 Some news to share…..the castle in Johnson City TN is for sale…….